SmartMotion™ is uniquely designed to support high-availability applications across different carrier coverage areas and require the ability to failover as well as bond LTE connections. With twin interdependent cellular modules, each with dual SIMs, (for a total of four SIMs), the SmartMotion cellular router provides a superior solution for mobility, reliability and security. 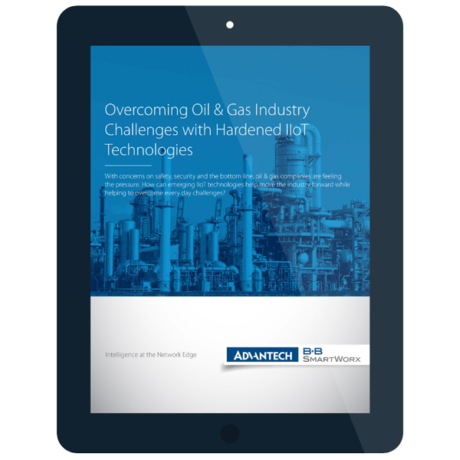 With the ability to support multiple cellular carriers and signal types, business continuity and mobile applications are never a problem with this automatic, advanced fail over architecture. Load Balancing will also simultaneously receive Cellular, WiFi and Ethernet data. SmartMotion™ provides transfer speeds up to 50 Mbit/s and download speeds of up to 100 Mbit/s meeting the high demand required for video transfer. SmartMotion™ is designed and tested to meet the requirements of industrial, mobile, security and other harsh environment application where standard commercial designs fail. Specifications include wide operating temperature ranges from -40 to +75 °C (-20 to +60 °C LTE450 module), input voltage range 10 V DC to 60 V DC, and advanced sleep mode feature to allow low power consumption for solar and battery power applications. 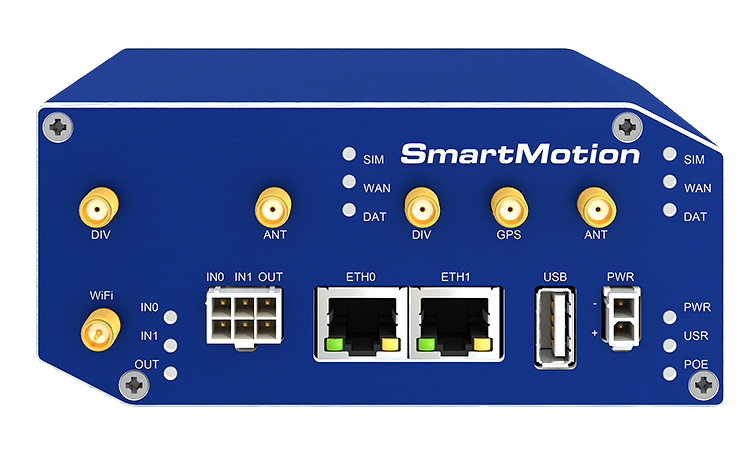 SmartMotion™ places intelligence out at the network edge with an extremely powerful CPU and enhanced embedded memory capacity providing full support for LTE/4G (long Term Evolution) speeds and applications. 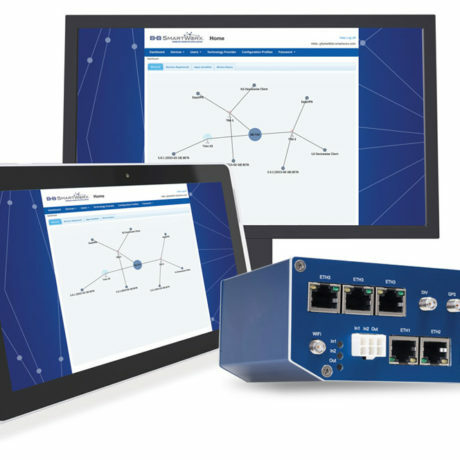 A secure Web interface allows users to configure and manage the SmartMotion™ from remote locations. The router can also upgrade its configuration and firmware from the operator’s central server, allowing for simultaneous mass reconfiguration of every router on the network. Users may insert Linux scripts and they can create multiple configurations for the same router. Users may switch from one configuration to another at any time. 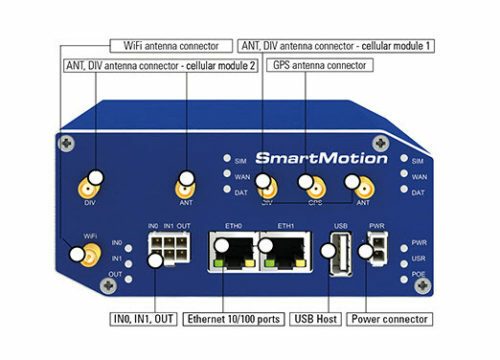 The flexible SmartMotion™ concept includes 2 Ethernet ports with 2 independent LANs/IP addresses. 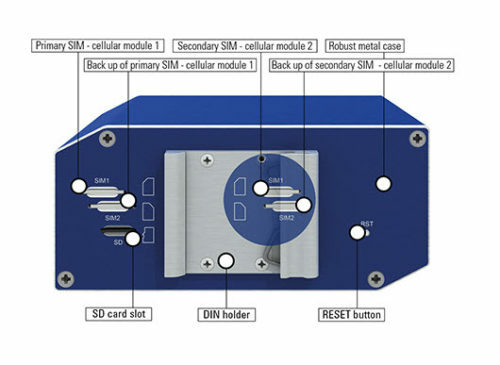 The standard configuration also includes 1 USB host port, 1 microSD card holder, 4 SIM card holders for automatic failover to an alternate service provider, 2 binary inputs(I/O) , 1 binary output (I/O) and onboard GPS. An optional built-in WiFi module is also available, with industrial grade operating temperature ranges from -40 to +75 °C (-20 to +60 °C LTE450 module). The SmartMotion™ supports real time data encryption and the creation of VPN tunnels using IPsec, OpenVPN and L2TP. It supports DHCP, NAT, NAT-T, DynDNS, NTP, VRRP, control by SMS, and numerous other functions, as well as additional software like SmartWorx HUB, SmartCluster VPN Server and R-SeeNet. Built on Cortex A8 CPU with 256 MB flash memory and 512 MB RAM. Detailed event history log, etc. SmartMotion™ is easy to install using SmartWorx HUB™, a full featured configuration and monitoring tool. Our VPN configuration tool, SmartCluster™, makes it easy to configure multiple routers via the same VPN tunnel. SmartWorx Hub lets you manage all of your routers from a single location, wherever you may be. It places configuration, diagnostic and management functions and a complete view of your installed device population right on your desktop. SmartWorx Hub takes device management to new levels of flexibility and efficiency. Traveling to a site to diagnose a fault, change a configuration or download new applications and firmware is inefficient and a waste of money, especially when the job must be done in a remote location or during out of office hours. Even with remote access to individual devices, operations like firmware upgrades are time consuming and error prone if they must be repeated for each device. SmartWorx Hub eliminates these problems. SmartCluster is a software designed to create a safe communications systems while using a public network – the Internet. SmartCluster is an OpenVPN server, which offers three functions for the creation of safe private networks in a public environment.